When you’re studying wildlife or hunting, you may come across deer. When near them, you may ask yourself — What Sound Does a Deer Make When Scared? Since most of us don’t really know their body language, you might get confused with their various noises. The truth is that, even though deer are quiet animals, they have specific alert calls you should pay attention to. So What Sound Does a Deer Make When Scared? When scared, deer produce a loud snort. It sounds like something between strong wheezing and the very confident strike of a guiro. However, this is not the only cue you’ll have to know they’re scared: the snorting usually comes with tail-flagging constant ground stomping. Deer do this to alert other deer there’s something suspicious in the area. You should also notice not more than one deer will start the alert call because of one potential threat at a time. That’s because it’s preparing the others to flee at any moment, while the others could even remain unfazed. Not all snorting is a danger alarm, though. Does may snort in frustration or anger at potential mates, and they may snort at anything that’s bothering them. This includes smaller animals, discomfort or even house pets. It seems does snort even as a mating call in some circumstances. Fawns bleat when scared, especially if separated from their mothers. They’ll run around looking for their herd, producing these squealing noises all the way. However, they can get louder and more frequent if they feel cornered. Furthermore, you should not confuse the different kinds of bleats a fawn can make. If you can, pay attention to their behavior to determine whether they’re scared or simply content. Deer are herd animals. They are generally not territorial — although this varies from species to species — and not aggressive. Thus, what scares deer the most are predators. If they spot a potential threat, the first thing they’ll do will be to alert the others. Here’s where the snort will come in: it’s more of a distress signal than anything else. Moreover, if they think you’re a threat, they’ll fix their gaze on you until you take action or leave. How To Find The Best Compound Bow For Deer Hunting? How To Find The Best Arrows For Deer Hunting? Because many deer species aren’t territorial, a buck probably won’t snort and stomp the ground because of other bucks. This means that if you hear this sound, it’s very likely that the deer is concerned about you. Check your surroundings to see if there’s anything else that could scare the buck or doe. If there isn’t, take immediate action. The longer you’re around, the more distressed the deer will become. The first thing you have to do if a deer is scared of you is to determine whether it has fawns under its protection. If it does, beware: deer aren’t aggressive, but does with fawns are more likely to attack. If it doesn’t, you should probably back off anyway: deer will flee to their herd at the slightest hint of a threat. And if they’re already in a herd, each one will run in a different direction and to a different location. When observing wildlife, you should note turning your back on the deer is the best course of action. This will make them less alert as you go away, allowing them to resume whatever they were doing. Conversely, if you’re hunting, you obviously don’t want to lose sight of the game. But that doesn’t mean you shouldn’t withdraw, either: deer have a good perception of their surroundings and quick reaction times. Bucks grunt either to round the herd up, to identify and trail other deer and to signal to other bucks they are dominant. Their grunt may sound like a roar at times, but it’s clearly a more nasal sound. Fawns bleat for just about anything: they bleat to call other fans to play, to call their mothers for food and to signal there’s something wrong with them. Does bleat too as a mating strategy to signal they have just reached heat. This sounds more like a cry as if a miniature-sized cow could moo. The sound most associated with the question “What Sound Does a Deer Make When Scared?”, like we discussed in this article. However, fear is not the only reason a deer can snort. In fact, snorts are vocalizations of almost any kind of frustration or anger. Deer may also snort to clean up their nostrils since their smelling sense is one of their most developed. Finally, mind the fact that while bucks aren’t particularly territorial, they will pick up fights with each other. This is especially true if they’re disputing over a mate. They’ll snort all the way through their fight. “What Sound Does a Deer Make When Scared?” is not the only question you may have about deer. There are a lot of tools online that you can use to study deer behavior and vocalizations. Most people looking for details about deer will be hunters and, if you’re a hunter, remember to hunt responsibly! If you’re simply curious or are an avid wildlife observer, get to know places that can satisfy this hobby. You may also live in an area with a great occurrence of deer. In order to know how to better preserve the animal life in your city, consult the Deer Task Force in your region or an agency like the QDMA. 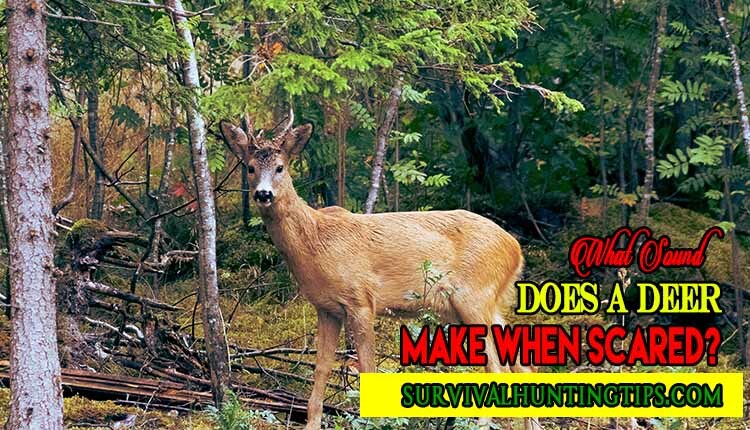 They should provide you with the adequate information to understand deer better and direct you to the best places to acquire the appropriate equipment and paperwork with which you can hunt or study them. Now that we have answered your question of “What Sound Does a Deer Make When Scared”, you might also want to know more about this fantastic animal by watching documentaries about it online? There’s a lot about deer you might not know yet!